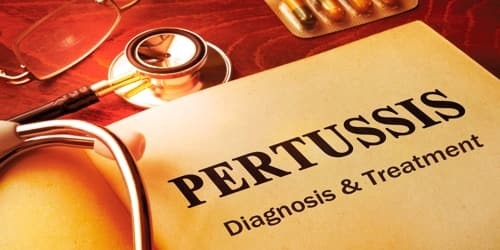 Definition: Pertussis (also known as Whooping cough or a 100-day cough) is an infection of the respiratory system caused by the bacterium Bordetella pertussis (or B. pertussis). In many people, it’s marked by a severe hacking cough followed by a high-pitched intake of breath that sounds like “whoop.” It spreads very easily, but vaccines like DTaP and Tdap can help prevent it in children and adults. Initially, symptoms are usually similar to those of the common cold with a runny nose, fever, and mild cough. This is followed by weeks of severe coughing fits. Following a fit of coughing, a high-pitched whoop sound or gasp may occur as the person breathes in. The coughing may last for 10 or more weeks, hence the phrase “A 100-day cough”. Deaths associated with whooping cough are rare but most commonly occur in infants. That’s why it’s so important for pregnant women and other people who will have close contact with an infant to be vaccinated against whooping cough. Diagnosis is by collecting a sample from the back of the nose and throat. This sample can then be tested by either culture or by polymerase chain reaction. Prevention is mainly by vaccination with the pertussis vaccine. Antibiotics may be used to prevent the disease in those who have been exposed and are at risk of severe disease. Causes, Sign, and Symptom of Pertussis: Pertussis (Whooping cough) is caused by a type of bacteria called Bordetella pertussis. When an infected person coughs or sneezes, tiny germ-laden droplets are sprayed into the air and breathed into the lungs of anyone who happens to be nearby. Others then can become infected by inhaling the drops or getting the drops on their hands and then touching their mouths or noses. Infected people are most contagious during the earliest stages of the illness for up to about 2 weeks after a cough begins. Antibiotics shorten the period of contagiousness to 5 days following the start of antibiotic treatment. The classic symptoms of pertussis are a paroxysmal cough, inspiratory whoop, and fainting, or vomiting after coughing. A cough from pertussis has been documented to cause subconjunctival hemorrhages, rib fractures, urinary incontinence, hernias, and vertebral artery dissection. Violent coughing can cause the pleura to rupture, leading to a pneumothorax. Complications can be life-threatening for infants younger than 6 months old. After about 7-10 days, the cough turns into “coughing spells” that end with a whooping sound as the person tries to breathe in air. Most people with whooping cough have coughing spells, but not everyone does. 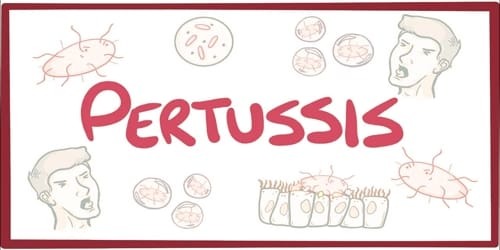 Diagnosis and Treatment of Pertussis: Diagnosing whooping cough in its early stages can be difficult because the signs and symptoms resemble those of other common respiratory illnesses, such as a cold, the flu or bronchitis. Sometimes, doctors can diagnose pertussis (whooping cough) simply by asking about symptoms and listening to a cough. Methods used in laboratory diagnosis include culturing of nasopharyngeal swabs on a nutrient medium (Bordet-Gengou medium), polymerase chain reaction (PCR), direct fluorescent antibody (DFA), and serological methods (e.g. complement fixation test). Pertussis (Whooping cough) is treated with antibiotics. Many experts believe that antibiotics are most effective in shortening the length of the infection when they’re given in the first stage of the illness before coughing spells begin. Prevention of Pertussis: Pertussis or Whooping cough can be prevented with the pertussis vaccine, which is part of the DTaP (diphtheria, tetanus, acellular pertussis) immunization. Preventive antibiotics, however, are still frequently used in those who have been exposed and are at high risk of severe disease (such as infants). Getting the vaccine is especially important for people who are in close contact with infants because babies can develop severe and potentially life-threatening complications from whooping cough. An adult’s immunity to whooping cough lessens over time, so getting vaccinated and protecting them self against the infection also helps protect their infant or child from getting it. Pertussis vaccines are effective at preventing illness and are recommended for routine use by the World Health Organization and the Centers for Disease Control and Prevention. The multicomponent acellular pertussis vaccine is 71–85% effective, with greater effectiveness for more severe strains.